transcosmos analytics Inc. (Head Office: Tokyo, Japan; CEO: Yoichi Kawano; hereinafter, transcosmos analytics), a wholly-owned subsidiary of transcosmos inc. (Headquarters: Tokyo, Japan; President and COO: Masataka Okuda; TSE First Section: 9715; hereafter, transcosmos) launched an initiative to deploy the world’s most advanced machine learning automation / AI platform “DataRobot” to transcosmos’s Service and Administrations divisions and develop over 100 data scientists, the masters of DataRobot. 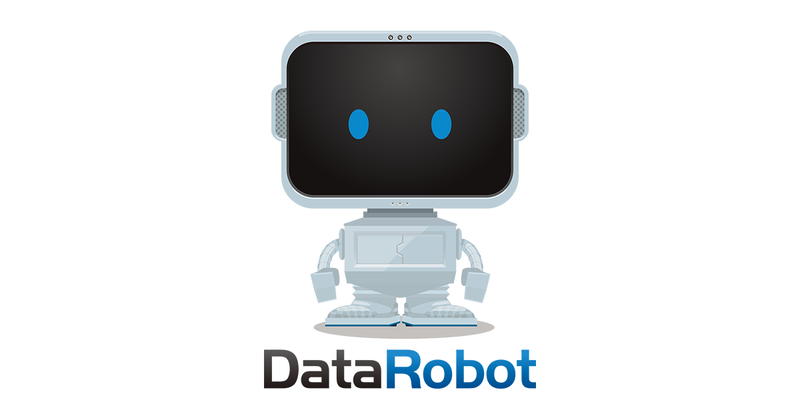 At the same time, transcosmos delivers DataRobot related services to its clients as a resell partner of DataRobot Japan by leveraging its best practices and know-how on developing data scientists. With over 20 implementation projects already up and running, transcosmos aims to achieve over 100 million yen in revenue in FY2017. transcosmos believes that AI and machine learning are not something that threaten human job security. Rather, these technologies can only unleash their full potential when they work with humans. In fact, AI and machine learning are not born smart. It is humans that make them learn and work smart. Still, it has been a bottleneck for Japanese businesses to “democratize machine learning” as it is a severe challenge to hire and develop data scientists who can master AI and machine learning. In order to overcome the challenge, transcosmos established the AI / Machine learning Promotion Office which drives “democratization of machine learning” and kicked off the project, “1 data scientist for 1 division”. As a first step, it deployed “DataRobot” which helps even an ordinal business person perform deep learning and other highly advanced analysis as if popping something in the microwave. Over 50 employees selected not only from Digital Marketing, E-Commerce, Call Centers and other Service divisions, but also from HR, General Affairs and other Administrations divisions, have received special training and are already working on deploying AI / machine learning in their workplaces across Japan. transcosmos gained significant success in “Nihon Chokuhan”, a mail order brand operated by transcosmos. By utilizing DataRobot for direct mail & catalogue delivery list management operations, sales went up by 150% while man-hour for the operations went down by 50% compared to the predicted model built by its traditional data scientist. transcosmos will utilize the success model across Japan and continues to develop more data scientists, with an aim to make more than 100 data scientists within this year. transcosmos will also help their clients drive their “democratization of machine learning”. 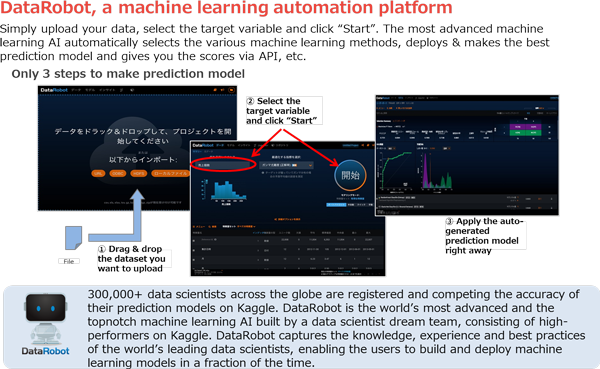 Leveraging the success made in “Nihon Chokuhan” brand and its know-how on developing data scientists, transcosmos will deliver DataRobot-related services as a resell partner for DataRobot Japan. Furthermore, transcosmos analytics’s data scientists, who have a wealth of experience, provide value-added services such as DataRobot workshops and training that are tailored to the actual use scenario for their clients. In addition, for the clients to develop a database environment for machine learning and to set links with external systems, transcosmos will provide integrated solutions by combining its unique DMP service “DECode”, “DECAds” series that deliver end-to-end services ranging from ads, marketing to customer support building on digital data, as well as various other outsourcing services. transcosmos’s origin of business is to deliver quality and valuable services by uniting “people” with “technology” through “scheme”. transcosmos continues to strive to create a world where humans and cutting-edge technologies like AI and machine learning live and prosper together. * transcosmos analytics is a trademark or registered trademark of transcosmos analytics Inc. in Japan and other countries. transcosmos launched its operations in 1966. Since then, we have combined superior “people” with up-to-date “technology” to enhance the competitive strength of our clients by providing them with superior and valuable services. transcosmos currently offers services that support clients’ business processes focusing on both sales expansion and cost reduction through our 172 locations across 31 countries with a focus in Asia, while continuously pursuing Operational Excellence. Furthermore, following the expansion of e-commerce market on the global scale, transcosmos provides a comprehensive One-Stop Global E-Commerce Services to deliver our clients’ excellent products and services to consumers in 49 countries around the globe. transcosmos aims to be the “Global Digital Transformation Partner” of our clients, supporting the clients’ transformation by leveraging digital technology, responding to the ever changing business environment. transcosmos analytics was established as a 100% subsidiary of transcosmos in May 2012, in order to provide KPO (Knowledge Process Outsourcing) service and to support clients in improving efficiency with their intellectual production activities whilst creating new values. transcosmos analytics responds to the rapidly-changing marketing environment flexibly and speedily in order to expand its clients’ profits and to maximize their customer satisfaction.